WASHINGTON (CNN) — Secretary of State Hillary Clinton was working from home Thursday after fracturing her right elbow during a fall the day before, State Department officials said. 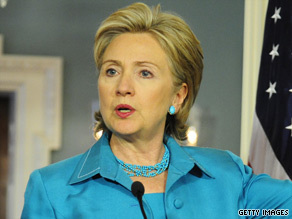 Secretary of State Hillary Clinton was treated and released after fracturing her elbow. Clinton fell Wednesday afternoon at the State Department on her way to the White House and was taken to George Washington University Hospital. She was treated and released. She will have surgery to repair her elbow in coming weeks. Clinton was with Richard Holbrooke, President Obama’s special envoy to Afghanistan and Pakistan, when she fell. “Secretary Clinton appreciates the professionalism and kindness she received from the medical team who treated her this evening and looks forward to resuming her full schedule soon,” said department spokeswoman Cheryl Mills. Philip Crowley, an assistant secretary of state, said Obama was one of the first people to call Clinton Wednesday night.